A few days ago an all points bulletin was posted that Ira Sanders had found a Curlew Sandpiper at Jackson State Park. An extremely rare bird for Colorado. The report found car loads of birdwatchers migrating to this reservoir about an hour and a half drive northeast of Denver on the promise of catching a glimpse. The Curlew Sandpiper is a small wader that breeds on the tundra of Arctic Siberia. It is strongly migratory, wintering mainly in Africa, but also in south and southeast Asia and in Australasia. It is a vagrant to North America. The bird had been seen as late as 6:30 p.m. the evening before, but by the time we arrived at 8:00 the next morning, and after a couple hours of searching through thousands of shorebirds lining the shores of this barren prairie pot hole destination, we came up empty handed. Jackson Lake is about an hour and a half east of Denver via Highway 76, the area mostly attracts folks interested in fishing and hunting. 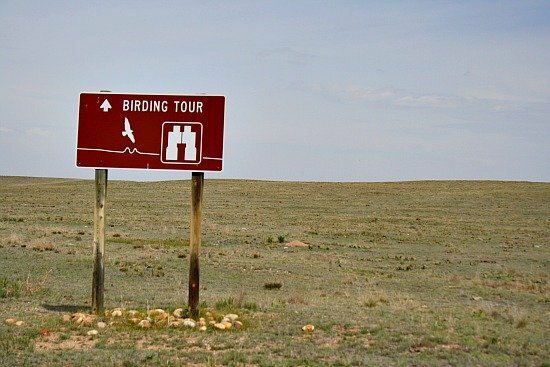 But on our Colorado Eastern Plains, this area can be a great location to find a variety of migrating birds in Spring and Fall. We had left home in such a toot, that I hadn’t packed a lunch, so on the way back into Denver, we decided to stop at the Pepper Pod Restaurant, in Hudson, for lunch. The historic Pepper Pod is celebrating 100 years of business and is an American steakhouse restaurant and bar with a rustic decor to go along with it’s rich history. A mounted buffalo head looms over you as you dine on specialties of chicken fried steak and burgers. Frames full of of Indian arrow heads are displayed at eye level in the booths. You know a restaurant is good when the parking lot is always full! I have no idea why I didn’t snap photos of the building or it’s interior, but here’s a shot of Bob’s Chicken Fried Steak with a scoop of creamy mashed potatoes and gravy. It was delicious and when we’re out birding in the area, we’ll certainly look forward to a return visit for this specialty. I ordered the burger and fries and loved every bite. The meal was large enough that I brought half the burger home. I didn’t notice any leftovers from Bob’s meal. Could be that I are some of it too. The chicken fried steak came with a trip to the salad bar, which we shared. Next time you’re driving east on I-76, stop at the Pepper Pod. Service was family friendly and the food will fill you up with comfort and flavor. This, my friends, is why it was a healthy salmon meal for dinner. As I mentioned, Jackson State Park is a popular destination to look for migrating shorebirds. I took this photo of a Fall plumage American Avocet. In spring you’ll find him in his art deco peach and black breeding plumage and walking on thin blue/gray legs. For his trip South, the bird transforms into a more plain black and white wader. He turns his long beak sideways to scoop up bugs that are swarming along the water’s edge.